If you are among the millions of home brewers that are lucky enough to own the popular Mr. Beer Home Brewing System, you will be thrilled to know that there are a variety of different types of home brewing refill kits to satisfy your ever growing passion for beer brewing. Mr. Beer Brew Packs refill kits contain everything you need to brew another two gallons of your favorite, great tasting home made beer. 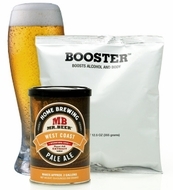 You can make a batch of the best brew in town in as few as 14 days with the Mr. Beer Brew Packs and you can be sure there is a home brewing refill kit that is guaranteed to satisfy every beer lover’s taste. Whether you are a fan of light beer, dark beer, American favorites, or International classics, there is a Mr. Beer Brew Pack made especially for you. Try delicious Mr. Beer varieties such as Patrick’s Irish Stout, Cowboy Golden Lager, Bewitched Red Ale, Grand Bohemian Czech Pilsner, and many, many, more. And if you really have a hard time deciding, (which you probably will), simply select the American or International Variety pack and you can make your favorite or try a new one. Also, the Mr. Beer Brewing Home System isn’t just for adults; let the whole family join in on the fun and make a batch of Archer’s Orchard Hard Cider, or everyone’s favorite, good old fashioned root beer! Each Mr. Beer Brew Pack makes about 2 gallons of your favorite style of beer and is made with only the best quality ingredients including choice malts and yeasts, so you get the best tasting beer from every batch you brew. Mr. Beer Brew Pack refill kits are guaranteed to keep your thirsty friends and family coming back for more…whether you want them to or not!